Ticks are often mistaken for insects, but they are actually small arachnids (like spiders and scorpions) that, along with mites, constitute the subclass Acari. There are roughly 900 tick species found worldwide and approximately 90 species located in the United States. The 15 different tick species that have been found in Maine are members of the family Ixodidae, which encompasses all of the hard ticks. 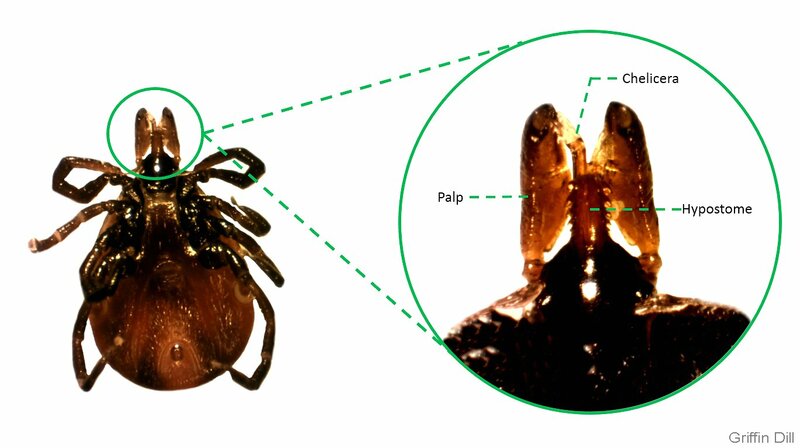 Hard ticks are distinguished from soft ticks (family Argasidae) by the presence of a scutum and a prominent capitulum (head). No species of soft ticks have been found in Maine. The tick’s form consists of a capitulum (head) and a flattened, oval-shaped body called the idiosoma. Like spiders and other arachnids, adult ticks and nymphs have eight legs, though larvae emerge from the egg with only six. Hard ticks, like the ones found in Maine, have a hardened plate on the dorsal surface called a scutum. On females, this scutum takes up approximately 1/3 of the dorsal surface and can be useful in differentiating tick species. On males, the scutum covers the entire dorsal surface and limits their feeding ability. The tick’s mouthparts are located on the capitulum and are made up of the chelicerae and hypostome, which are used to penetrate and secure the tick to its host. 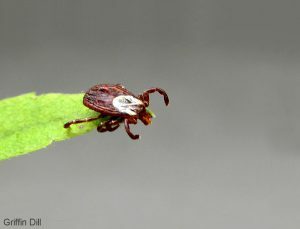 During feeding, ticks secrete substances that help anchor it to the host, act as an anesthetic to mask the pain from the bite, and prevent blood from coagulating. Since ticks are efficient feeders and tenacious once attached, there is potential for transmitting disease. Mainers should be in the habit of performing tick checks after frequenting tick habitat. Most of the tick species in Maine undergo a three-host life cycle in which they feed on a different individual host at each active life stage (larva, nymph, and adult). Upon hatching from the egg, six-legged larvae (sometimes called seed ticks) seek out and begin feeding on their first host. It is typically during the larval stage that the tick becomes infected with disease-causing organisms. Once fully engorged, the larval tick drops from its host and molts to a nymph. The nymph will then locate and feed on its second host, release, and molt into an adult. The adult tick feeds upon a third and final host. Once mated and fully engorged, the adult female tick will deposit a single batch of several thousand eggs into the leaf litter and die. The entire life cycle takes place over the course of one to three years depending on the species of tick. 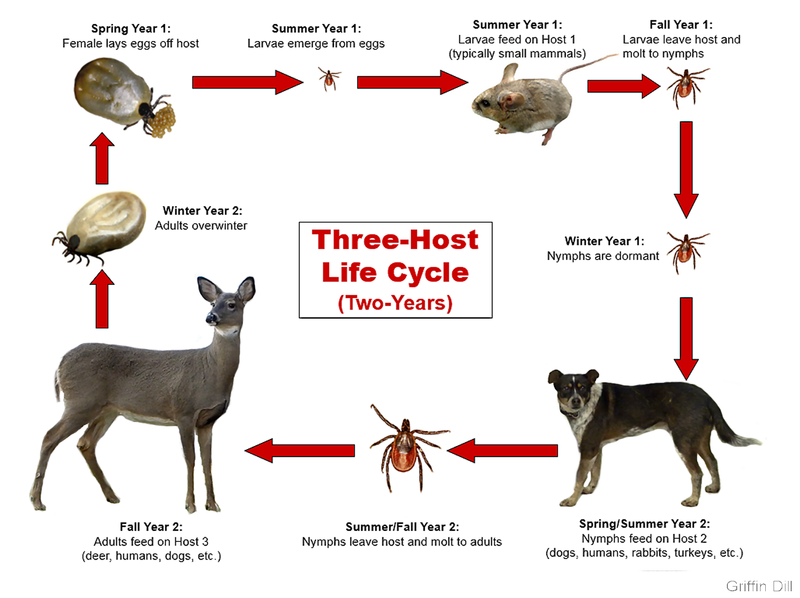 An exception to this three-host life cycle is the winter tick which experiences a one-host life cycle, spending its entire life on a single host, primarily moose. Ticks don’t jump or fly or drop from trees onto their hosts. They typically use a passive behavior known as questing to seek out their hosts. 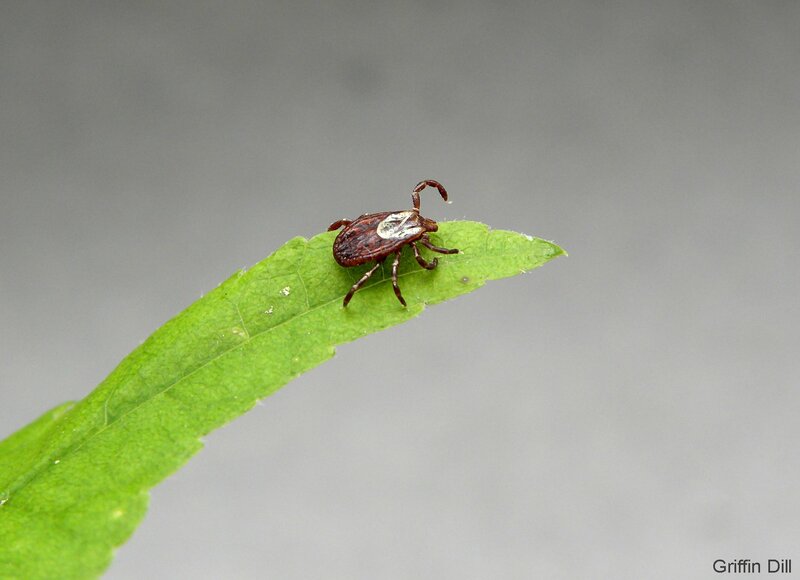 When questing, a tick will perch at the end of a piece of vegetation with front legs extended and simply latch on to a suitable host as it passes by. This behavior is intensified in response to certain stimuli, such as carbon dioxide, body heat, vibrations, and other bodily cues. Some tick species are more aggressive in response to these stimuli and will travel several meters to locate a host. 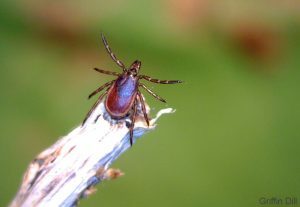 Once the tick is on a host it may immediately attach and start feeding or it may wander around before settling on a spot. Feeding may last several days or up to several weeks depending on the species. Females utilize these extended feedings, while males only take small occasional blood meals, if they feed at all. Males will remain on the host for extended periods in order to find a mate. Tick habitat can vary depending on the tick species’ preferred host. Some species are found primarily in the burrows, dens, or nests of their host, while others may be found in a variety of settings. Ticks are highly susceptible to desiccation (drying out) and thus need habitat with relatively high humidity to survive. 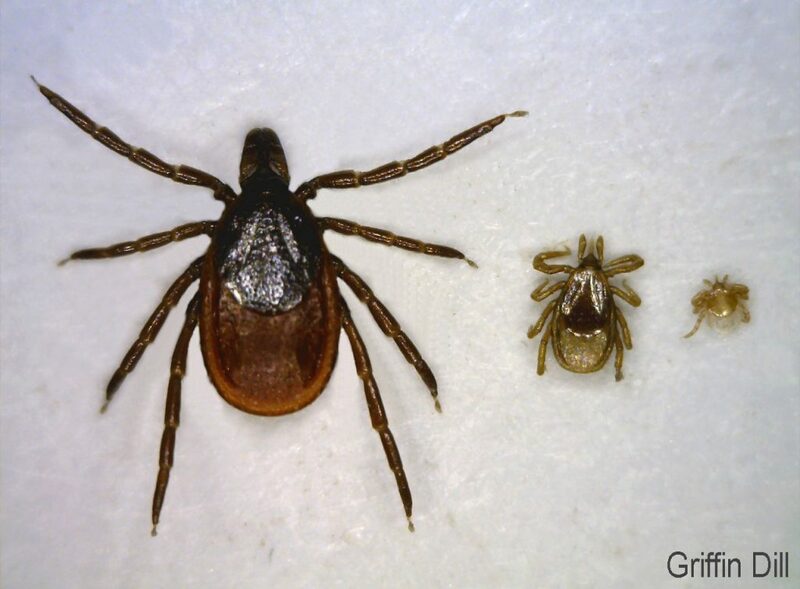 In general, ticks tend to be found in wooded areas, tall grass or brush, the edges where woods and lawn meet, in the leaf litter, under ground-cover plants, and around stone walls and woodpiles where small mammals live. Within this habitat, ticks generally quest in vegetation at the height of their preferred hosts. Larvae tend to remain close to the ground where they are more likely to locate small mammals. Nymphs and adults typically move higher into the vegetation but generally stay below waist-level. Identifying and eliminating tick habitat around one’s property is an excellent way to reduce exposure to ticks.